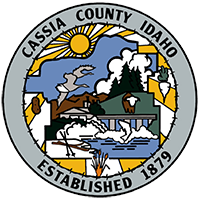 Cassia County, Idaho was created on February 20, 1879, by an act of territorial legislation. At that time, the county included all of the territory south of the Snake River from Raft River on the east to Devil Creek on the west side of the city of Twin Falls which was near the boundary of Owhyee County. The first county seat of Cassia County was Albion. The county was named after Cassia Creek which derived its name from two words: cajeaur, peasant French for raft; or James John Cazier, a member of the Mormon Battalion and a colorful captain of an emigrant train, whose name was corrupted to Cassia. Most natives of Cassia County hold that the word comes from the "cassia" plant which does not grow along Cassia Creek. The first human inhabitants of the area that is now Cassia County were the Paleo Indians who settled in the area 15,000 to 16,000 years ago. Later the Shoshoni and Paiute people established communities in the area using the natural bounty of the land to hunt, fish and gather on their seasonal rounds. The first known white settler to arrive in Cassia County was Charles Gamble, a 22-year old man from Maryland. Gamble settled in the Raft River area in December of 1866 with a herd of cattle and his cowboy associates. Although Mr. Gamble may have been the first settler in these parts, he was definitely not the first man to enter the boundaries of Cassia County. In the 1860's, thousands of pioneers passed through the area which is now known as the City of Rocks. It was a common place for the wagon trains headed to Oregon or California to stop and rest. Local history enthusiasts have discovered that there are approximately 230 miles of authentic emigrant routes crossing Cassia County. By 1868, pioneers were settling in Marsh Valley (now Albion). The next ten years saw people moving to Malta, Elba, Almo, and Oakley. While cattlemen and sheepmen grazed their herds, Mormon pioneers began farming operations near the Oakley Basin. Oakley became known as the educational and religious center for the Mormon pioneers who settled in the area. In the first year or two of the century, a man named David E. Burley, a passenger agent for the Oregon Short Line Railroad Company, traveled through this area. While working for the Oregon Short Line, he became familiar with the area and its ability to grow sugar beets. In 1905, a man named I.B. Perrine and five others platted a town on the south bank of the Snake River. This town, of course, became known as Burley, Idaho. The town wasn't incorporated until July 19, 1909. It wasn't long after Burley was established that the townsfolk announced that they would do everything they could to move the county seat from Albion to Burley. They weren't successful until 1918 when Burley officially became the county seat of Cassia County. The smaller present-day towns of Almo, Elba, Malta Albion, and Oakley were settled in the 1870's, and Burley was founded in 1905. On November 5, 1918, the county seat was moved to Burley. The present day courthouse was built in 1939 and is still being used for county government. It is on the list of the U.S. Historical Buildings. The oldest building still in use in the county is the Tracy Store in Almo which opened in 1894. In 1995, Cassia County had a population of 20,811 people and comprised an area of 2,577 square miles. At the turn of the century, many cattle and sheep were being raised in the area. Eventually, cattlemen and sheepmen began to argue over grazing rights. One feud led to the arrest of the famous hired gunman, Diamondfield Jack Davis in 1897. Diamondfield Jack, who was hired by a cattle rancher to keep sheepherders off his land, was accused of murdering two sheepherders in February of 1896. It wasn't until November of 1900 that two cattlemen confessed to the murders. Mr. Davis was eventually pardoned in 1902. Documents from the trial proceedings involving Diamondfield Jack are kept in the archives of Cassia County. In 1904, construction began on the Minidoka Dam as the first government Reclamation Project in Idaho. Until that time, a few farmers had built water wheels to move water from the river to their cattle and crops. With the arrival of irrigation, more farmland was established. Grains, sugar beets, potatoes and alfalfa were in demand across the country and the south-central Idaho soil and growing season were perfect for growing these crops. Since 1917, records show that Burley temperatures have ranged from 106 degrees in July 1934 to -35 degrees in January of 1922. On average, there are 45 days per year when the temperature reaches 90 degrees or higher. There are 5 days per year when temperatures fall to zero or colder. An average growing season lasts from May 9 to October 3. Acres of public lands provide hunting, fishing, hiking, camping, horseback riding, bicycling opportunities. The Snake River provides boating, boat racing, water skiing and fishing. Pomerelle Ski Resort provides early and deep snow for snow skiing and snowmobiling. The mountains offer paragliding and hang-gliding. The City of Rocks National Reserve is a unique area and provides pioneer trails, recreation and scenic drives. The City of Burley provides golfing and each city in Cassia County has parks and softball facilities. The Cassia County Museum located in Burley is a must to visit and the Cassia County Fair and Rodeo is one of the largest in the state. These and other areas make Cassia County appealing to both residents and tourists. South of Burley is a section of the Sawtooth National Forest which is the home of Mt. Harrison and Lake Cleveland. This mountain and lake were named from the 1888 presidential election -- the winner's name, Benjamin Harrison, went to the high mountain, and the loser's name, Grover Cleveland, went to the lower, less visible, lake. Mt. Harrison has an elevation of 9,285 ft. To the south is Cache Peak, the highest point of Mt. Independence. Cache Peak has the highest elevation in the county, 10,339 feet above sea level. Cassia County is home for many industries. Ore-Ida Foods now known as McCain’s was built in the 1960's and processes French fries and hash browns. Boise Cascade Corp., a manufacturer of cardboard boxes and other materials, operates southwest of Burley. In addition to these corporations, there are numerous potato processing plants, machinery manufacturing companies, milk processing farms, feed mills, commercial feed lots, and gravel and cement processors. Well-known Simplot Industries started in Cassia County. Because of the diverse amount of agriculture, Cassia County is one of the leading agricultural counties in the state. It's ability to produce wealth from beef cattle, dairy cattle, sheep, potatoes, sugar beets, beans, and cereal crops also makes it a leading county in the nation as well. Approximately 82% of the total economical sales in Cassia County are from agricultural production and about 78%of direct or indirect employment is dependent upon agriculture. If there are other interesting and important aspects of Cassia County that you may be interested in, please contact Cassia County Historical Society & Museum at (208)678-7172.